A simple relic of 20th century life has taken on new meaning for archaeologists: The ring-tab beer can — first introduced 50 years ago — is now considered an historic-era artifact, a designation that bestows new significance on the old aluminum cans and their distinctive tabs that are still found across the country. “Once an artifact attains the 50-year threshold, it is eligible to be recorded as an archaeological site or an isolated find in most states,” said William Schroeder, an archaeologist with the firm Reiss-Landreau Research in Yakima, Washington. 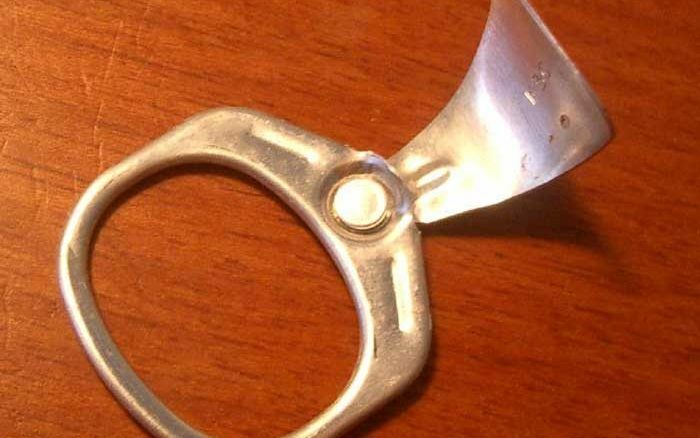 Schroeder discovered that this year marked the golden anniversary of the aluminum ring-tab while investigating a modern midden of beverage cans in Washington State. “I was tasked with a small survey near the Cle Elum Dam in central Washington,” he said. Eventually he was able to discern labels on some of the cans that dated them to 1968 — not quite at the half-century threshold. But the project still pointed out the need for a resource that archaeologists could use to date cans and their leftover tabs — which tend to be found more often than the cans themselves — and in turn help determine the historic value of sites where they’re found. “Many folks have something of a fascination or passion for old beer cans, yet few had any knowledge that there were different kinds of openings, or that there was a way to tell the age based on the opening style,” Schroeder said. After doing some research, he was able to find a comprehensive history of the American beer can — published by the Society for Historical Archaeology in 2009 — and then track down photographs of most of the known styles of tabs. Schroeder then put this information together in a “key card” for archaeologists to use in the field. Along the way, he found that, although other iterations of the pull tab were briefly used, the best-known version had reached an important milestone. “Ring tabs came into existence in 1965 — and meet the minimum age threshold now!” Schroeder said. The ring-tab design began to be phased out in 1975, after injuries were caused by people swallowing the metal tabs. It was replaced with a new modification called the StaTab, which used a flange of aluminum on the lid as a lever to press down on the sealed opening, a design that’s still in use today. These small changes in design can make a big difference, Schroeder noted, because the ring-tab’s new status means it can be used to identify sites that may have historic value. As an example, Schroeder cited a site that a colleague has been investigating in Washington: a campground that became one of the first major meeting places for the gay and lesbian community in the Northwest in the 1970s. “The site may well be eligible to the National Register of Historic Places as a Traditional Cultural Property,” Schroeder said. “Yet all that remains are camp pads, fire rings, and pull tabs. So, theoretically, the pull tabs may be the only way to place a temporal frame around the site, as none of the features will reveal specific enough age or date range. Schroeder stresses that the mere presence of 50-year-old ring tabs doesn’t automatically endow a site with protected status. And in some states, the age threshold for historic significance can range from 45 to 75 years. But the 50th anniversary of the ring-tab is just the latest reminder that once-forgotten bits of material culture are constantly taking on new meaning as they age, a process that archaeologists need to heed. “Some folks were disgusted with the thought of having to record an archaeological site of pull tabs; others are excited at the opportunity,” Schroeder said. “Some find the artifact so mundane that it is not worthy of recordation, yet they’d stop to record a hole-in-top can. “It’s going to take time until pull tabs become recognized to the extent that field personnel will know, ‘Hey, this is a site!’, just like they would if they found three pieces of cryptocrystalline silicate debitage [bits of stone used for making tools] on the surface,” Schroeder added. Schroder shared his research, and his key cards, earlier this month at the Northwest Anthropological Conference in Eugene, Oregon. The pull tab phase out was slow and lasted into the 1980’s. I was born in 1976 and suffered many injuries opening pull-tab Coke cans. The tabs weren’t necessarily a problem by themselves. But during the early 1970s, the drive to reduce litter included a campaign to stop tossing the tabs onto the ground. The solution was to just stick them in the can after you were finished drinking. Unfortunately, most people put them in the can BEFORE drinking the contents, resulting in obviously injuries and deaths due to choking. And it wasn’t just Coke. All canned beer had them too. My only injury was cutting my tongue on the sharp hole in the can. Is it possible to have a high resolution version of William Schroeder’s key card? As an archeologist for the NPS, it would be a very useful reference to have in the field. This is crazy and a irresponsible use of the NHPA. What can be learned from this? well it does help people in the metal detecting hobby approximately date the site they are hunting. Older tabs, more likely the existence of old silver coins. The pull tab was invented in 1962 and first used by the Pittsburgh Brewing Company for Iron City beer. I know for a fact it was still in use by Narragansett Brewing of cranston,RI in 1977. 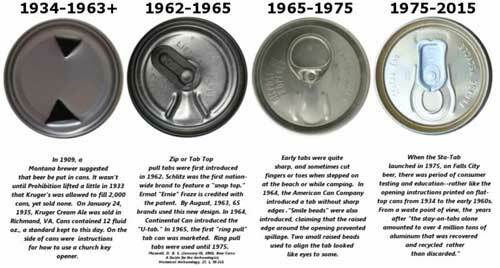 Before pull tabs, there were also cans with a bottle cap on a conical rather than flat top. 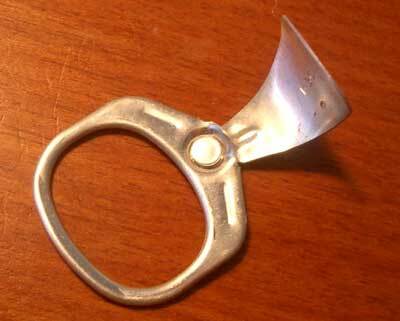 And the tab-less flat tops requiring a can opener were certainly around for some brands for a number of years after tabs were first introduced. get a metal detector. you will find those beaver tails by the ton at any park or place where people were. We drank the beer while we were in high school and we scattered the trash. For the kids that grew up in the area, underage beer drinking at the lake was a rite of passage. If you want to search for old cans and bottles, just head to Hudson Bend on Lake Travis in Austin TX. The water has receded so low that multiple generations of trash have been exposed. Starting near the top of the bank you find red bulls. 15 ft lower you find Pepsi Twist cans. Lower still you find 70’s and 80’s cans, old mountain dews and Budweisers. Then you get into 60’s era cans. down near the water line you can find old glass bottles. I vote that they all get cleaned up rather than garner archaeological status because it looks terrible but it is definitely fascinating to explore along the water’s edge . I read the pulltab story in Lost Treasure magazine and liked the pulltab identification chart. Could you please send me a copy? I would like to add the chart to my reference album. Thank you. Could you possibly send me the chart of beer tabs that was mentioned in the October issue of Lost Treasure? Thanks in advance. this is very interesting thank you for sharing. this summer I was up by the AJ mine here in Juneau Alaska, and I found like 2 or 3 of these, the only reason I kept them is because my cousin collects them. I’m looking forward to sharing this article with him thank you. I am an archaeologist with a Cultural Resource Management firm and need to train a lab crew in identification of recent historic and modern artifacts. William Schroeder’s paper and key cards would be very useful. Do you have contact information for him? Are they of any value,or collected? My father just gave me a bag full of them he collected.